Once upon a time there was a distinguished salon of noblewomen who to pass the time in a pleasing and creative manner invented stories and tales of fairies. 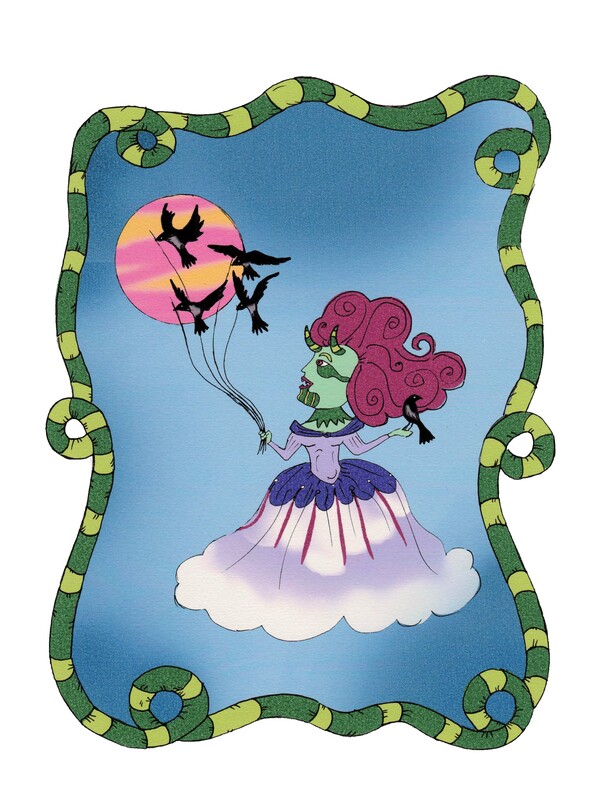 One such woman came up the fable “Beauty and the Beast,” which was to be the most popular of all the salon’s offerings. Those familiar with the story will wonder what fairies have to do with it, but the mystery is soon revealed: the version known to all was shortened and simplified over time. Originally, it is true, the main character Belle was a graceful and virtuous girl, but she was also the secret daughter of a king and a fairy. An exceptional woman, she knew to look beyond the appearance of things, and with her purity could break the spell that held the Prince captive inside the body of a beast. As in any self-respecting fairy tale, Belle and the Prince crowned their tempestuous relationship with marriage and all rejoiced in the union: never before had anyone seen two such beautiful beings, they seemed made for one another. The two avoided any talk of when the Prince was the Beast, like a couple that tries to dodge puddles during a storm. It was unpleasant for either to be reminded that Belle had been the genteel prisoner of a monster, or of the curse he harbored in his past. They swore eternal love and clearly could live but happily ever after. However, as the daughter of a fairy, Belle was suspicious by nature. No more would she let her eyes be deceived when she had glimpsed the Beast’s qualities than she would allow herself to be blinded by the appearance of a Prince endowed with great physical beauty and elegant manners. She feared that she perceived a certain change in her husband’s demeanor, as if perhaps the affections he had displayed for her when he was under the spell had diminished now that he was once again his youthful self. Being attracted to a beast is unusual, forbidden, thought Belle. Whereas now she had that handsome man in the flesh and blood. For a young girl awakening to love and sensuality, details are important and how romantic those magical excursions were that the Beast dreamt up to stave off her boredom: winding through the rooms of the enchanted palace, Belle was transported to the theatre, the fair, the circus… Each day was a new experience, not unlike what we do today with channel and internet surfing. His reaction did not at all please her, so Belle devised more magic. She made the wand spin seven times in the air and took on the form of a striking and provocative woman. She had herself announced to the castle as a thespian traveling with her company of actors and the curious Prince immediately received her. In just moments, won over by her pulchritude, he was unabashedly courting her, ignorant to the fact that she was in fact his wife. Belle’s reasoning was precisely that of a fairy. The docile and sensible girl had in her soul a strength that made her fight for justice. So, for a third time, the maiden used the powers of the magic wand. In a flash, she was transformed into a Beast far more fearsome than the Beast in which had beat the heart of the Prince. All the palace inhabitants were at once petrified, darkness fell in the gardens and the gates were bolted shut. The oblivious Prince, who was playing soccer with some courtiers, found himself alone, enshrouded in a strange atmosphere. In a flying cart pulled by crows, there glided before the castle entrance a new Beast, terrifying to behold, monstrous in speech, ungainly in movement. Unbeknownst to him, Belle decided to take him captive and maintain her beastly form until he proved to feel affection and compassion for that being, as she had previously done, with modesty and love. Which is why “Beauty and the Beast” should be considered, for all intents and purposes, a fairy tale. Once upon a time a little girl became a heroine to all. She was, in fact, a special girl, a very lucky girl. First deceived then devoured – along with her grandmother – by a ferocious wolf with whom she should never have spoken, she was quickly freed by a hunter and resumed her normal life as if nothing had happened. You have surely caught on that I am speaking about Little Red Riding Hood. After the incident, the girl returned to her regular routine: going to school, helping her mother and crossing the wood every so often to visit her elderly grandmother. But she had learned her lesson and was very careful with all those who were strangers to her: she was no longer distracted to pick flowers and walked straight forward when any wolf tried to bother her. It could be said that everything was as it once was for Little Red Riding Hood. Except that she felt peculiar. Ever since the day of her terrible encounter with the wolf, the girl was not herself. “What is it with this c…cape that is so t…tight and bothersome?” she wondered. But she knew very well that the problem lay not with her clothing. “Maybe it’s all g…g…gone to my head?” Her case had, in fact, been much discussed: so much notoriety could play ugly tricks and of late she had seen many little girls, dressed just like her, wandering in the wood. Though, of course, blonde curls and a red cape were not enough to be Little Red Riding Hood! The girl sometimes had trouble falling asleep, or would wake up in the middle of the night, breathless and yearning to be outdoors. One night the full moon disrupted her slumber. Sitting up wide awake in her bed, she decided to open the window, to breathe in lungfuls of air. Then the unthinkable happened: Little Red Riding Hood felt the urge to open her mouth wide so as to breathe better but from her throat came a noise that sounded like the howl of a wolf. “What? That could not have b…b…been me! What is happening to me?” Aghast, she clasped her hands over her mouth while her tongue, which seemed longer than usual, licked something that felt more like fangs than teeth. The girl could never have imagined what had happened. The fact that she had been devoured, entirely, by the astute and voracious wolf had left its mark on her. 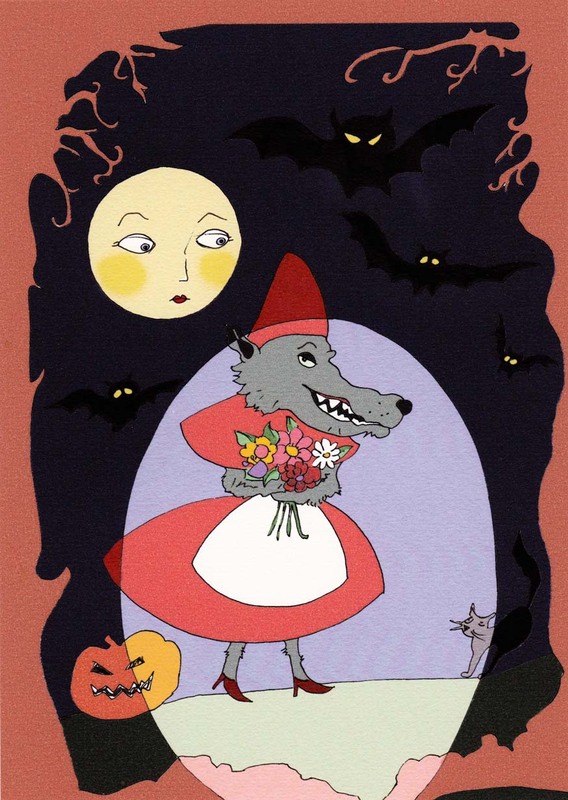 Little Red Riding Hood had been sullied by the beast and was now turned into a werewolf. On the nights of the full moon, the nature of the wolf overtook and transformed her body. But being too young to understand, she returned to bed, smoothing down the hairy tail that had cropped up at the base of her back. The following morning the girl was once again her normal self. She remembered a few images of what had transpired the night before as if part of a nightmare. “There’s always more and more s…st…stuff to take to grandma!” exclaimed the little girl, who was even more on edge for not having reposed well. “Go on, be a good girl…” her mother insisted. So Little Red Riding Hood put on her infamous cape and set out into the wood to her grandmother’s house. Halfway there, the girl came across a wolf. At first it seemed the wolf wanted to speak to her, to bother her, but when the animal sniffed her, the color drained from its body and it quickly vanished into the trees. “How truly st…st…strange!” she observed. When she arrived at her grandmother’s house, the girl knocked on the door. “Who is it?” asked a feeble voice from inside. “It’s Little Red Riding Hood!” said the girl, quite amazed by the tone of her own voice, more cavernous than usual. The girl was reassured and spent the entire day sewing and chatting with her grandmother. It was evening when Little Red Riding Hood set out to return home to her mother. As soon as she left her grandmother’s house, she noticed a full moon shining in the sky. There was nothing left of her blonde curls as her body quickly mutated: it its stead was a gray wolf. The beast became agitated and whimpered, ferociously scraping at the wooden door. Her grandmother, who had just taken to her bed, looked out the window and saw the wolf. She immediately thought of her granddaughter: “If the wolf is wandering about the house, at least it won’t give chase to Little Red Riding Hood!” She opened the window and summoned her friend the hunter, who ever since saving her life was always on alert in his cabin beyond the clearing. The hunter arrived swiftly with his rifle already loaded, and settled into position to shoot the wolf. Naturally, he did not recognize Little Red Riding Hood: the animal had nothing of the sweet and delicate girl. No one had ever heard talk of werewolves in that wood. Unaware that, in that moment, the girl was closer to her than ever. Corrado Premuda è uno scrittore e giornalista italiano nato nel 1974. E’ autore di narrativa e saggi, di testi per il teatro e la radio, di cataloghi d’arte. Ha pubblicato i libri “Un racconto di frammenti” (2000), “Intrusioni” (2004), “Sazrijevanje” (2010), “Felici e contente” (2013), “Un pittore di nome Leonor” (2015) e ha tradotto e curato “Murmur. Fiaba per bambini pelosi” di Leonor Fini “(2014). Molti suoi racconti sono pubblicati in riviste e antologie. Il suo sito web è www.corradopremuda.com. Thanks to Andrea Guerzoni for his illustrations from the volume of stories by Corrado Premuda, Felici e contente (2013). This entry was posted on February 19, 2015 by frankmattermag in italian, story, translation.